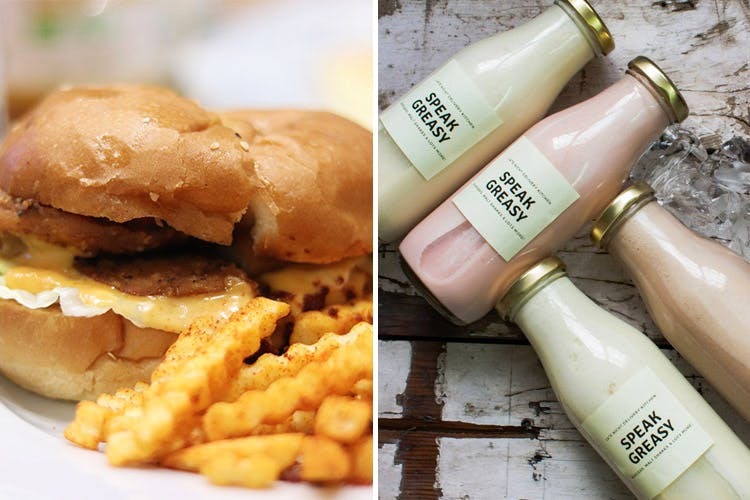 Speak Greasy is a new late-night delivery joint based out of GK that's doing brilliant burgers, pastas and fries till as late as 3am. Mushroom Alfredo pasta, Queenstown burger. They're not flashy, they're not over the top. They believe in simple, good food and that's exactly what they deliver. They deliver till 3am, and they're doing exactly the kind of stuff you'd be craving in the middle of the night when you get those midnight munchies—or you're craving some grub after a night of drinking (their delivery is super-quick). We tried (and loved) their bacon mac & cheese, mushroom Alfredo pasta (we ODed this), the Queenstown burger (a deadly combination of lamb and bacon) and the Geneva (fried chicken and bacon, brought together with melted cheese). Their burgers are the real deal here, with generous portions of meat, flavour-packed sauces and pickled veggies. We're trying the Amritsar, a grilled paneer burger and the Ludhiana, a burger with fried chicken tossed in desi makhani gravy, the next time around. They're functional from 6 PM onwards, but we hear they plan on starting delivery around lunchtime soon. The veg burger we tried, Morocco, had a chickpea patty that was a little dry, but the sauces saved the day. Instead of ordering fries, munch on their in-house potato wafers—they're paper thin and come with their burgers.